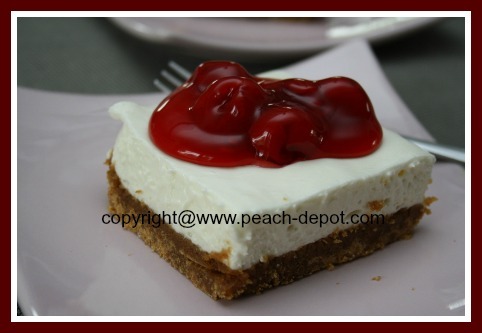 This is a very easy No-Bake Peach Cheesecake Recipe! 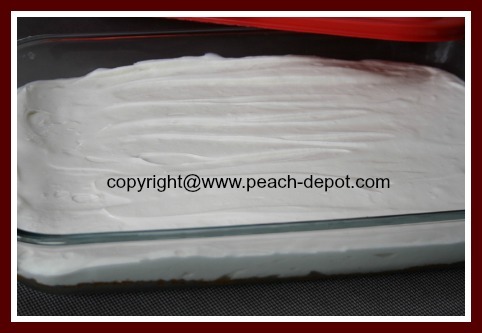 It is "lighter" than most other cheesecake recipes, and you can use ANY type of fruit topping such as fresh fruit or fruit jam, jelly or spread. This recipe makes 3 cheesecakes in a pie pastry or crumb crust, or one cheesecake made in a 9" x 13" baking dish with a crumb crust. This recipe makes three cheesecakes, using only 500 grams (2 packages) of cream cheese! I like to make this scrumptious dessert when I have all the family over for a visit. It is quick to make, and everyone l-o-v-e-s it! I used my yummy homemade peach freezer jam for the topping! 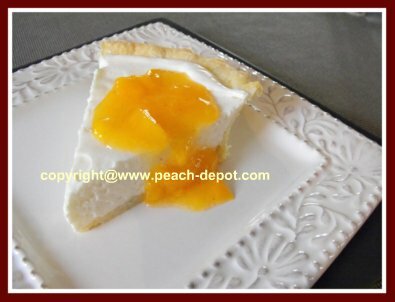 choice of fresh peaches, canned peaches, peach sauce, or peach jam (for topping) OR ANY OTHER TOPPING of your choice. In a large bowl, with an electric mixer, beat the cream cheese, sugar and lemon juice together to dissolve sugar. Beat until the mixture is no longer "grainy". In another bowl, whip the dessert topping with the milk, as per the package directions, until stiff. Fold the whipped dessert topping into the cheese mixture, mixing (with the electric mixer), until well combined. Transfer the cheese mixture into 3 prepared pie crusts, filling about 2/3 full, to allow room to top the cheesecakes with your choice of fruit, fruit sauce, or jam. Chill for at least 4 hours before serving, (or overnight). Spread the fruit or fruit topping over the cheesecake just prior to serving. This recipe can be adapted to used with ANY topping, for example, blueberry sauce, raspberry sauce, strawberry sauce, or any other topping of fresh fruit, canned fruit, fruit sauce, fruit spread, fruit jam, or canned pie filling (cherry), of your choice! BEST No-Bake Light Cheesecake EVER!